All of our Good Neighbor® fence designs are framed in to create an identical look on both sides. They are hand crafted and custom-built on site. All of our fences are made of rough sawn Northern White Cedar boards and framework, and treated Red Pine posts. This particular design is a 4" on center spacing with 4x4 treated posts, which are topped off with standard beveled caps. As always, this entire design is flexible to meet the customer's needs. Feel free to refer to our post cap page and gate page for further options. If you are curious as to how your fence will weather if left unstained, refer to our durability page for a photo. For the convenience of our customers we provide installations year around, however, be sure to plan ahead on your installation. The summer months are very busy, and this will allow us to accomodate for your holiday parties or pool installation. Contact one of our estimators for a free appointment to discuss design and pricing options. 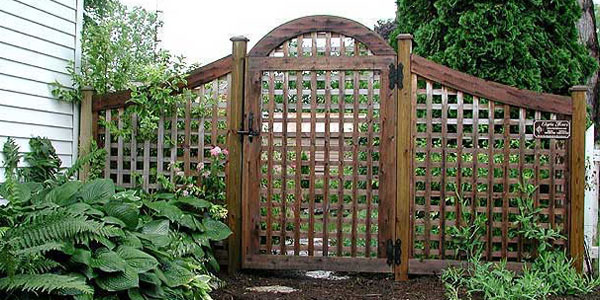 If you are making every effort (like we are) to be a bit more "green" in the way that you live your life - check out this link for information on our environmentally friendly fence products. Don't be fooled by our name - Elyria Fence has been pleased to offer our privacy fence designs, picket fences and semi-privacy fencing for installation in the following Ohio cities since 1932: Akron, Amherst, Ashland, Avon, Avon Lake, Bainbridge, Bath, Bay Village, Beachwood, Bedford Heights, Bellevue, Berea, Berlin Heights, Birmingham, Bratenahl, Brecksville, Broadview Heights, Brooklyn/Old Brooklyn, Brookpark, Brunswick, Carlisle Township, Catawba, Cleveland, Cleveland Heights, Columbia Station, Cuyahoga Falls, East Cleveland, Eaton, Elyria, Fairview Park, Fairlawn, Garfield Heights, Gates Mills, Grafton, Hinckley, Huron, Hudson, Independence, Kelly's Island, Kipton, LaGrange, Lakeside Marblehead, Lakewood, LaPorte, Litchfield, Lodi, Lorain, Lyndhurst, Macedonia, Maple Heights, Medina, Milan, New London, New Russia Township, North Olmsted, North Ridgeville, North Royalton, Norwalk, Oberlin, Ohio City, Olmsted Falls, Parma, Penfield Township, Peninsula, Pepper Pike, Pittsfield, Polk, Port Clinton, Put-In-Bay, Remindersville, Rittman, Rochester, Rocky River, Russell, Sagamore Hills, Salem, Sandusky, Seville, Shaker Heights, Sheffield, Sheffield Lake, Sheffield Township, Sheffield Village, Solon, South Amherst, Spencer, Strongsville, Tremont, University Heights, Valley City, Valley View, Vermilion, Wakeman, Wellington, Westlake, West Salem. Not on the above list? If you reside in Huron County, Erie County, Lorain County, Medina County, Cuyahoga County, Summit County, and western Geauga County then we probably work in your area. Give us a call at 440-323-7581, and we can quickly let you know either way. Copyright © Elyria Fence Inc 2000-2019. All rights reserved.